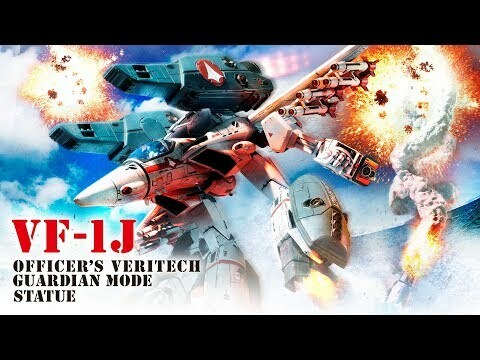 Prime 1 Studio and Harmony Gold are proud to present PMRT-01: VF-1J Officer’s Veritech Guardian Mode from Robotech Saga. The Veritech VF-1 is Earth's first transformable trans-atmospheric fighter. Powered by fusion engines, the VF-1 is fully space-capable, and is carried in great numbers on the SDF-1 as well as the Armor series of carriers. The VF-1 supports 3 modes of operation: fighter mode for aerospace superiority missions, guardian mode for close air support missions, and battloid mode for ground combat missions. VF-1J Model can be identified by its unique head and piloted by leaders of 3-man groups or full Squadrons. It stands about 33 inches tall and can be equipped with or without a FAST Pack space booster and weaponry system. This system vastly improves the speed and survivability and giving it access to extra ammunition. This is the must have piece for all Robotech fans. © 1985-2017, Harmony Gold USA, Inc. All Rights Reserved. ROBOTECH and associated names, logos and all related indicia are trademarks of Harmony Gold USA, Inc. All Rights Reserved.